And might I start by saying, thank God he is not a Met. How brutal would that have been? I might have hated him just a little bit. 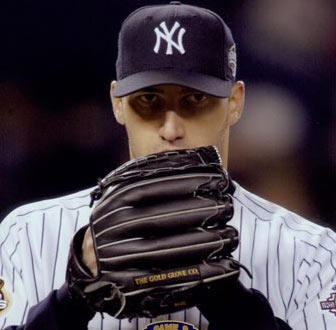 Pettitte refused a deal earlier in the off season in which the Yankees offered him $10 million for one year. Now the offer that they agreed to is one year, $5.5 million, plus a nice group of incentive bonuses which could end up paying him $12 million by season end if he reaches those goals. NEW YORK -- Andy Pettitte never needed to hear the offers that might have awaited him in free agency. He had decided that by the time winter turned to spring, he would have somehow wound up back with the Yankees. It took longer than expected, but Pettitte has finally crossed the finish line. The veteran left-hander agreed Monday to a one-year, $5.5 million contract with the Yankees, with incentives that could push the total value of the deal to $12 million. "There was no other team ever brought into the equation," Pettitte said. "My mind never changed. I wanted to come back to the Yankees, and in my mind, I was going to be back." Discussions between Pettitte's representatives and general manager Brian Cashman had continued for weeks, with both sides insistent that they wanted to work out a deal. But, as Cashman said at one point, it had grown more complicated. "Andy said every step of the way that he wanted to be a Yankee," Cashman said. "I remember him telling me at one point in this process, 'Cash, if you guys want me back, we will find a way to get this thing done.' He honored that." While the negotiations were described as cordial, the two sides had one major stumbling block to get past. The 36-year-old's agents, Randy and Alan Hendricks, advised Pettitte that the Yankees' initial offer -- one year at $10.5 million -- represented too large of a pay cut it represents from the $16 million he earned in each of the last two seasons. Pettitte said that he believed Cashman's word that the Yankees wanted him back, and once he had decided to pitch in November, he decided that it would only be for the Yankees. He did check in with Joe Torre at one point about possible relocation out west, but even the Dodgers manager expected Pettitte would eventually hammer something out in New York. "I felt quite sure that one way or the other, we were going to get something worked out," Pettitte said. "I'd be lying if I didn't say, 'Heck, is this going to ever get done?' It was taking so long. I was very impatient, and it tried my patience. But I just trusted that things would work out." Though Randy Hendricks said that he was certain Pettitte could have found more money in free agency, he was tethered to his client's wishes of pitching for only the Yankees. Pettitte isn't thrilled about the pay cut, but the end destination is what he was more concerned with. "I guess it does take a shot at your pride a little bit," Pettitte said. "But when you put all that aside, I wanted to play for the New York Yankees. That was the bottom line. I wanted to be there and play in that new stadium." The Yankees remained unwilling to budge from the neighborhood of their original offer, exhibiting tight wallets in harsh contrast to the $423.5 million in combined commitments that wooed CC Sabathia, A.J. Burnett and Mark Teixeira. After the Yankees inked Teixeira to an eight-year, $180 million deal two days before Christmas, even Pettitte began to wonder if there would be anything left in the organization's coffers for him. Had Pettitte not agreed to get creative with the structure of his deal, there might not have been. After completing business at the Winter Meetings in Las Vegas, Cashman met with Pettitte face-to-face in Houston on Dec. 11, a detour that set the negotiations back on track. There, Pettitte informed Cashman that he had "absolutely no problem" with the idea of an incentive-based contract, a concept that the Steinbrenners signed off on. With less than three weeks remaining before Yankees pitchers and catchers report to Tampa, Fla., Hendricks called Pettitte and informed him that the club had made its last offer. "I think Cash and I both knew that if we don't get it done now, we'll probably never get it done, and time will pass this by," Hendricks said. "We just made a committed effort to roll up our sleeves and put a pencil to everything." Pettitte said that, having heard the final parameters, his response did not require much thought. "We were at the end of the line and I needed to make a decision," Pettitte said. "I'm extremely happy to be coming back." Hendricks was asked if his camp had any regrets in not taking the original flat offer of $10.5 million, which would have represented a $5.5 million cut. Instead, Pettitte is taking a gamble by decreasing his base pay by $10.5 million. "I think time will tell," Hendricks said. "If in fact Andy does in 2009 what he's done before, he'll actually make more money, so in that case we'll have no regrets. If things go wrong, we might be in a position to say we should have taken the left fork in the road." If Pettitte remains healthy and performs to caliber, an increase should be reachable. Last season, Pettitte was 14-14 with a 4.54 ERA in 33 starts last season and has logged at least 200 innings in four straight seasons. But he was hampered by a shoulder injury that forced him to falter down the stretch last year, going 2-7 with a 6.23 ERA over his last 11 starts. The Yankees ordered a medical exam on Pettitte late in September and were pleasantly surprised when it came back clean, with only rest needed to restore Pettitte's strength. Pettitte slots in as the likely fourth starter in a rotation that will be headlined by Sabathia and Burnett. Chien-Ming Wang is expected to serve as the No. 3 starter, coming back from his season-ending foot injury, and Joba Chamberlain rounds out the rotation as the No. 5 starter. "I'm very excited about it," Pettitte said. "With every signing that we did, for me, it was, 'OK, I'm coming back. I want to be part of this.' I just think that we're going to have an unbelievable staff." it wouldn't have been as bad as seeing glavine in pinstripes. That was a horrible 5 years. Horrible. I'm kinda unhappy about this. I mean, I have nothing against Pettitte. He has done some great stuff for us throughout the years. But I was really hoping that Phil Hughes would get to see more action this year. There's still a chance Hughes could be long man out of the bullpen or replace an injured player. I was just hoping to see Phil Hughes compete for a spot in the rotation and win it. The name of the game in starting rotations nowadays is depth. The days of four guys starting 36 games each and bullpen guys hacking out the rest is long gone. If you want to get to the playoffs you need a solid five man rotation with two or three guys behind them who can be effective if someone gets hurt. Don't worry, Hughes will get some starts this year. Question: which blogger/trader just had the best Monday ever?